The story I used to hear was long ago when they buried the chiefs of the villages and the islands, that they buried him with his things that he treasured and [that were] sacred…[They] put them in the cave where they put him, after they mummified him. 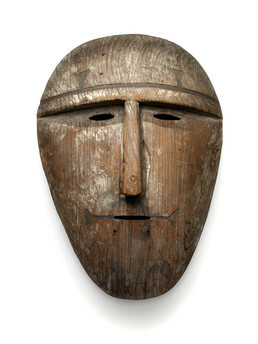 Masks were worn during the elaborate plays (ukamax) that Aleutian Islands villages presented to invited guests from other settlements, accompanied by generous feasts and gift-giving. In the chief’s communal house, masked performers enacted hunts, battles, and ancestral legends for the assembled guests, accompanied by drumming and songs. In other kinds of winter festivals masked men and women danced to the beat of drums and carried bladder-rattles made from inflated seal stomachs. Traditionally, the masks they wore were either destroyed or placed in caves, never to be used again. Mary Bourdukofsky: It’s a little child. Maria Turnpaugh: [He looks] happy, look at his eyes.